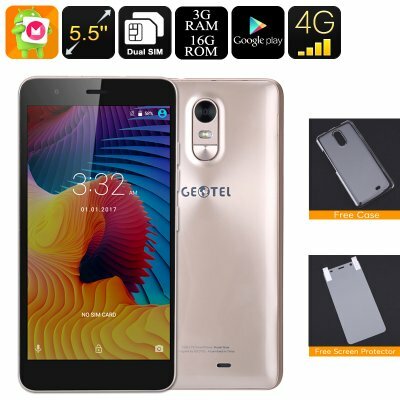 Successfully Added Android Smartphone Geotel Note - 5.5 Inch Display, Dual-IMEI, Google Play, 4G, Android 6.0, Quad-Core CPU, 3GB RAM (Gold) to your Shopping Cart. The Geotel Note is a great Android smartphone that comes with a price tag of less than 100 US Dollar. Although cheap in price, this affordable Android phone comes packed with sophisticated hardware that allows this phone to handle the latest software features and mobile applications available on today’s market. The phone runs on an Android 6.0 operating system thanks to which it will treat you with a smooth user experience. Whether you use it to play games, watch movies, enjoy mobile applications, or simply browse the web and send out some messages – this mobile phone is guaranteed to meet all your basic smartphone demands. On its 5.5 Inch display, the Geotel Note smartphone portraits all your favorite media in crisp 720P HD resolution. With access to the Play Store, you’ll be able to download and enjoy unlimited amounts of mobile entertainment without needing to spend a dime. The next time you’ll head out and need to spend several hours in the back of a bus, or are waiting for your friend to arrive, there will be no reason to feel bored again. Supporting a decent 16GB of internal memory and a 32GB SD card slot, there is plenty of space for you to store your latest downloads. Underneath its beautiful HD display, this Android phone packs a Quad-Core CPU that can reach speeds up to 1.3GHz. Additionally, it comes with 3GB of RAM and an epic 3200mAh battery. With all this hardware in place, you’ll be able to enjoy the most demanding of games and applications for hours in a row without needing to worry about running out of juice or slowing down your device. The Android phone furthermore supports 2 IMEI numbers and 4G connectivity. No matter where you’ll be heading next, with this Android phone at your side you’ll always be able to stay connected to your friends and family back home. The Geotel Note comes with a 12 months warranty, brought to you by the leader in electronic devices as well as wholesale electronic gadgets..